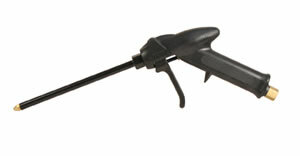 Sharpshooter applicator guns are specially suited for use with Touch 'n Seal® gun foam products. From the disposable SS-D to the premium long barrel foam applicators, there's a model for every budget including cylinder foams. Extension tips can be added to extend reach and improve maneuverability in tight spaces, while long barrel guns add even greater reach – up to 39 inches.